Honda ST1300ABS. Illustration Courtesy of American Honda Motor Company. I know a number of guys with whom I used to ride and we still converse. Most of them are happy with older motorcycles that have a level of technology with which they are comfortable, in terms both of self-maintenance of their bike, or the level of performance they provide. In some ways, I understand this. Over nearly thirty years worth of owning, riding and testing motorcycles, I see a trend by manufacturers to provide ever higher levels of performance and handling, while also attempting to make their machines more durable and reliable. The question for me is, "How much technology do I need?" My second motorcycle was a 1978, 980cc BMW R100RS sport-tourer, the bike that set the template for this category of bikes. Of overhead valve design with pushrod-actuation, it was a direct lineal and technological descendant of the firm's first R32 motorcycle of the late 1920s. Producing about 60 rear wheel horsepower, it was capable of nearly 130mph in 1977, due to its wind-tunnel designed fairing. Smog regulations caught up with the old air-cooled semi-antique design by the time the last ones rolled off the Berlin assembly line in the early 1990s. Compression ratios went from 9.8:1 down to 8.2:1, power dropped from 60 to perhaps 45, carburetor throat size from 40mm to 32mm, cam timing was relaxed and the power band and rev ability dropped in breadth. At the same time this was happening, their frames and swingarms had been reinforced, forks got larger in diameter and brakes were improved in feel, lever effort and power. Wheels finally accepted tubeless tires in wider sizes, though the tires themselves remained bias-ply construction. The bikes handled much better, but there was less power available. Since then, BMW has introduced three new generations of flat-twin powered bikes, featuring air/oil cooling, four valves per cylinder, mid and overhead cam designs and currently liquid cooled heads; all this attempting to provide greater power and durability. I read with some interest that their 1,200cc twins now produce a claimed 125 gross horsepower. Their chassis have also undergone rapid and radical development. In most of the BMW bikes designed since 1994, the engine and transmission essentially are the chassis, with only sub-frames bolted onto the front for the headstock and onto the rear for the upper suspension and a place for the rider to sit. Of course, wide wheels equipped with radial tires accompanied the nearly universal fitment of anti-lock braking systems that started back in 1989. However, since the mid-2000s, some chinks have appeared in BMW's armor with regards to durability and reliability. Once used to be able to rely on the mid 1990s bikes to run between 100,000 and 200,000 miles without major mishap, but the newest models have now fully embraced electronic sophistication, as have the Company's cars, with equally spotty results. Where am I going with this? For me, I am willing to accept and even desire a certain level of modern sophistication, governed by how the bike dynamically feels, but also up to the level of my comfort in maintaining the thing. While the 1994-2002 Oil-head twin's roughly 82 rear wheel horsepower marked a 30-40% increase in power over the older bikes, its relative simplicity, despite digital fuel injection, means that it is no more difficult to maintain than the older bikes. In most ways, it is easier. There is little question that it is also easier and faster to ride. The static stability, relatively quick steering, loads of suspension travel, thick seat with tool-less height adjustment, large fuel load and lockable, easily removable luggage make them nearly ideal traveling companions. Unfortunately, when you layer on GPS, CAN-BUS circuitry, cruise-control, rider adjustable throttle maps to quicken or soften response and electronic adjustable suspension, I begin to wonder where the bike ends and a car begins. Sadly, that stuff has not proven all that reliable or easy to service, even for dealer personnel who have the diagnostics, special tools and training necessary to carry it out. Needless to say, the costs of maintenance have skyrocketed, as well. All brands of motorcycles have succumbed to this New Order. We demand more from today's bikes, just as we do from modern cars. We want instant starting, extended maintenance intervals, more power and better handling, so manufacturers have had to add levels of complexity to their machines. 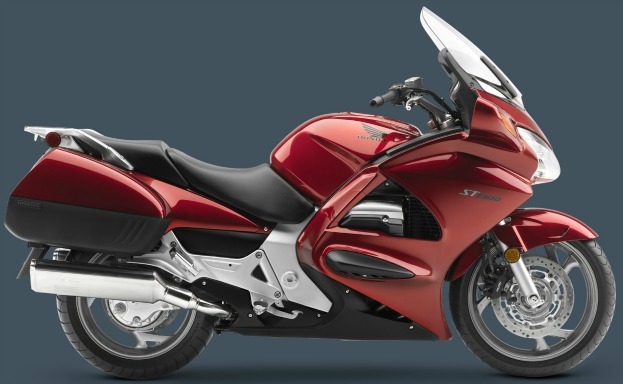 Even Harley-Davidson has put out their "Project Rushmore" baggers that have liquid cooled cylinder heads and some actual attention paid to airflow through their otherwise traditional looking bat-wing fairings. Since EPA regulations are not going away, nor do I think that a new Administration is going to de-fund that inflated bureaucracy, this process will likely continue. So far, the Japanese appear to have the best handle on incorporating all this electronic wizardry without causing heartburn to their riders. This is best expressed by police (hard) use of the now 13 year old Honda ST1300ABS/TCS and the relatively upstart Kawasaki Concours 1400 sport tourers as patrol motorcycles. Both of these bikes are well proven, durable, reliable and offer higher performance than any twin-cylinder bike in this kind of duty. They are also less expensive. Where does that leave you and me? Well, if you are very flush with a steadily growing income, you can buy what you want and pay for dealer service. You will enjoy the fruit of what imaginative engineers around the world can provide you during your comfortable and enjoyable ride. As for me, I am no Luddite. I do not wish to go back to drum brakes, bias-ply tires, points ignition, or even carburetors. I want more than 3.5 inches of suspension travel and sufficient alternator output to easily handle electrically heated clothing and grips for both me and a passenger. I also want the EFI and ECM that the motor needs to run properly. I do not oppose environmental sensitivity and would prefer to leave the emissions gear operable, including a quiet exhaust. However, that is about as far as I am willing to go. While I may not revel in the past as much as some riders and I am willing to accept a certain amount of technology, I draw the line at being able to understand and maintain the machine. In addition, I continuously review the long term durability of these somewhat simpler machines. In my view, they are less hassle and, fortunately, have depreciated to the point that they can be purchased used for perhaps 1/4 the price of an equivalent displacement new motorcycle. Of course, parts support is necessary and a long production run means this is unlikely to be a problem in our lifetime. Given this, I should probably consider for my next motorcycle the very mature technology of the Honda ST1300. It has ABS and traction control, program EFI and a basic, but quite comfortable, ergonomic arrangement. There is an under seat 7.5 gallon fuel load and short 58.9 inch wheelbase. It is reported to steer very quickly. They are plentiful on the used market, mostly because guys are always casting about for the next great thing, when sometimes they already have it. Then again, I no longer do multi-state tours, so the equally modern H-D Street Rod, the good handling version of the moribund V-Rod series, is also worth considering. In either case, the combination of old-school and new-school is compelling, for all the above reasons.